We've finally hit the end! (Can you tell my enthusiasm has waned significantly from the first travel recap post?) Our last "real" day of vacation (not counting the day of deathly stomach virus and the day of 24 hours of flying) was spent in the adorable town of Stockholm, Sweden. I wasn't sure I would be so enchanted by the place, but it's the one city where I really felt like we MISSED something. It just was not enough time. 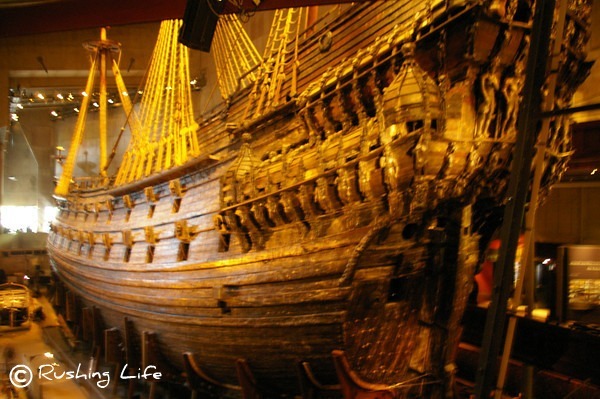 In everything I read pre-trip, The Vasa Museum just jumped out on everyone's list of recommendations. And it didn't disappoint. After a tender ride, a bus, and then a tram, we ended up at this magnificient museum to see one of the world's oldest, in tact, vessels. This grainy photo doesn't even do it justice. (No flash and no tripod = very mediocre photos!) It was about 5 stories tall and the wood was intricately carved on every surface. The basic gist of the backstory was that it sailed in the early 1600s, but sank just past the harbor on its maiden voyage. It stayed buried under the sea until around the 1960s. Due to the cold water off the coast of Sweden, where no wood-eating bugs live under water, it was almost perfectly in tact. Some painstaking renovations later, the Swedes have one of the most badass boats I've ever seen. For lack of a better comparison, Skansen is a site similar to Colonial Williamsburg. I have cuter pictures of buildings (and pastries) and windmills, but thought this photo gave you the general idea better. It was a seemingly sprawling amusement park of a place. There were some rides, some zoo animals, some historic buildings (obviously) and even a ferret adoption. It's also where I may, or may not, have eaten a reindeer hot dog. I was way too afraid to question it. Puff was very proud. The Gamla Stan area of town is the "Old Town" where the adorable buildings line cobble stoned streets. Unfortunately, we never found charming photos or saw any charming video before we left. 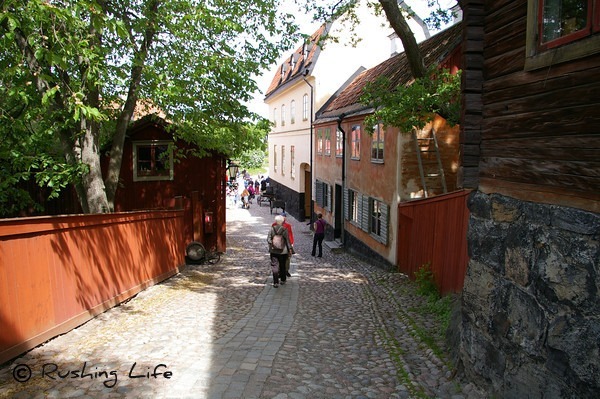 That's why we opted to do Skansen instead of meander the streets. Granted, we needed to see more cobble stones like a hole in the head. But when we got a quick glimpse, while snapping a few quick photos of a cathedral and the Royal Palace, before our bus back to the ship, we were DEFINITELY irked that we didn't have more time. It would be a great city to stay in overnight, when the daytrippers are gone. It was so user-friendly and the people were fantastic. And that food festival they were setting up looked divine! 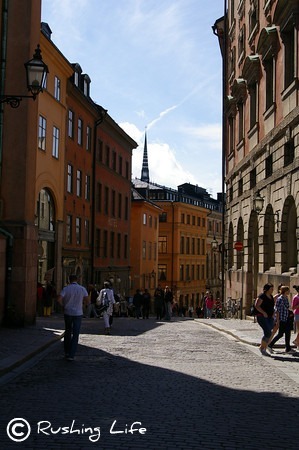 When we were pulling out of town and caught only a mere glimpse of the steeple from their fabled Town Hall, Puff mentioned that maybe when we go to Norway, we can have an extended layover in Stockholm to catch all the things we missed. Never mind that Sweden is farther east. I was just thrilled that he was throwing out a new travel destination. Want a Rubber Ducky Too?